RAIN in the summer-cropping areas of Queensland and northern New South Wales in the past week has failed to depress grain values, which are also holding strong in southern NSW and Victoria. This is despite large tonnages of Western Australian wheat and barley, nearly all of which has been forward sold to end-users, arriving at ports from Geelong to Brisbane. Sorghum for prompt delivery on the Darling Downs of southern Queensland has been trading today at around $365 per tonne, up $3-$4/t from last Thursday, in a market Emerald Grain merchant Doug Murphy said has been “subdued and lacklustre”. “Prices firmed early in the week, and they’ve stayed there,” Mr Murphy said. While up to 150mm of rain fell in pockets of the Downs and northwest NSW between Thursday and Sunday, many cropping areas got less and Sgm prices are close to unchanged, pretty subdued and lacklustre, prices firmed $3-$4/t early in the week. “The rain came at an in-between time,” Mr Murphy said. In the Brisbane free-on-truck market, wheat has continued to trade above $400/t, and barley at $355-$360/t. “Wheat has seen very few bids. The end-user is locking in tonnage, and we might not see much buying from them over the next couple of months,” Mr Murphy said. In southern NSW, Kelly Grain trading manager Matt Kelly said hand-to-mouth buying has continued at values unchanged from last week, with barley from South Australia and Victoria’s Western District making its way into the Goulburn Valley and Corowa regions at around $370/t delivered. “There’s not a lot of barley available in southern NSW and northeast Vic, so it’s got to come from somewhere,” Mr Kelly said. Wheat, largely from the Western District, is offered into Melbourne and the Goulburn Valley at around $400/t. “Most of the grain in southern NSW is moving into Griffith,” he said. Some sorghum from the Liverpool Plains has continued to make its way into the Griffith region, with Baiada’s Hanwood poultry operation the major consumer. That sorghum hasn’t made the impact on values into that Griffith market we might have expected,” Mr Kelly said. 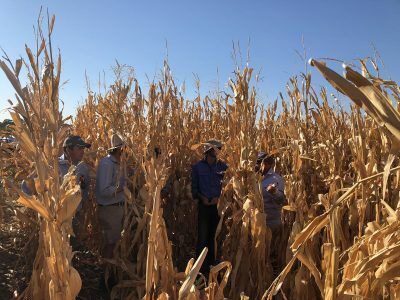 The maize harvest in the Murray and Murrumbidgee valleys is now under way, and is expected to continue into early May. Mr Kelly said much of the maize would likely be consumed in central and southern NSW to replace barley as a supplementary feed for sheep. The major central NSW customers are Uncle Ben’s at Bathurst, and Friskies at Blayney, both pet-food plants, who traditionally source maize from the Riverina in autumn. Feed maize has been trading in limited volume at around $450/t ex farm, but irrigated yields have been unusually low because of the excessively hot and dry summer. “Corn can get up to 15-18t per hectare, but they might be more like 8-10t/ha this season,” he said. As consumers keenly anticipated shutting the door on a forgettable cottonseed year, one which saw price volatility reach a record 4-times magnitude, the spot market this week had softened by about $10/t. Picking and ginning were slowly gathering pace. Woodside Commodities manager Hamish Steele-Park said though current crop and new crop markets still were reflecting a sizeable inverse, he expected it would come in quickly once ginning started. “March delivery would need around $760/t delivered Downs to buy. I’d call the delivered Downs first half April price around $660/t, while May onwards gin spread would still be around $605/t,” Mr Steele-Park said..
At $605/t delivered Darling Downs, the gin spread market quote was unchanged from the previous week.